Do you want to give dad a gift he will love for Father’s Day, but your budget is tight? 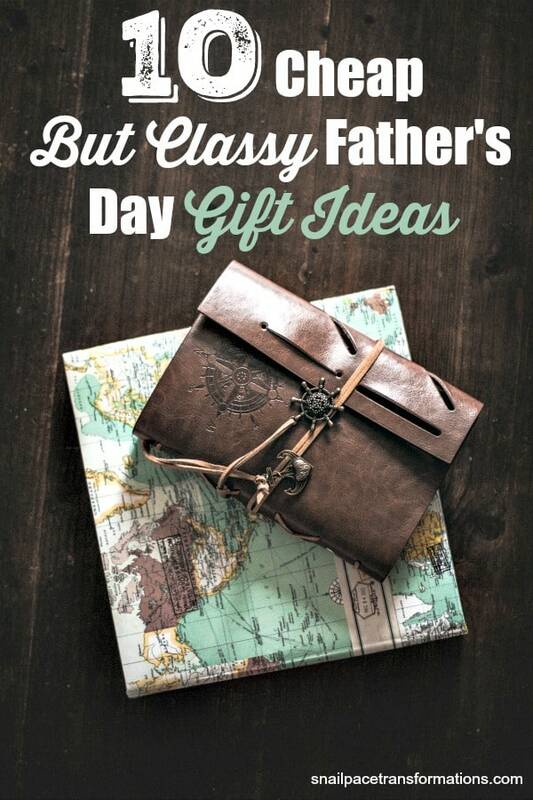 Here are 10 Cheap but classy Father’s Day gift ideas–surely one will be a perfect fit for your dad and your budget. Most dads love t-shirts. Get him one that spells out how great he is. Is he a Star Wars lover? Then he might like this shirt. Is he known for his abilities to fix just about anything? Then this shirt will let the world know. This fill-in-the-blank journal will touch dad’s heart. It will be a walk down memory lane enjoyed for years to come. Remind dad of how vital he is to his children with this personalized keychain. Join Recyclebank and earn enough points to get dad a subscription to a magazine on a topic that would interest him. Recyclebank is a point reward company that pays you for learning and performing environmentally sound practices. Magazine subscriptions start at 120 points, and it doesn’t take long to earn that many. Go here to sign up. Got a minimalist for a dad? How about giving him a gift card to his favorite place to eat? Psst…here are 15 places where you can earn gift cards. Some through doing things you already do without getting paid. I have readers reporting earnings of up to $100 a month with these programs. This post explains all the places I find free Shutterfly product codes for photo albums, prints and more–all would make great Father’s Day gifts. I increase my savings by using gift cards for Shutterfly that I earn through InstaGC to pay for the shipping. Take dad bowling, golfing, to a concert, or perhaps zip lining or rock climbing all for less than you might think thanks to daily deals found at Living Social. Does your dad have a sweet tooth? Why not bake him up a batch of his favorite cookies? Not that great at baking? Here are 5 super simple no-bake recipes that require just measuring and stirring–no oven required. For the Star Wars fan, this mug will be cherished. For the handyman dad, this saying is certainly true. Chances are dad’s phone goes with him everywhere so what better way to show off which team he loves than with a phone case that sports its logo. Bonus: send him a free e-card using Dayspring. They have plenty of designs to choose from and they make them easy to be shared through email or the social media platform of your choice. How To Give Awesome Clutter-Free Gifts: Plus 10 Great Ones!